Open 1st April 2014 to 30th May 2014. Have you downloaded the ‘Make it Yours’ Clutch Bag pattern? While it’s entirely optional, you might like to consider entering your completed bag into the ‘Make it Yours’ sewing contest – there are prizes to be won! 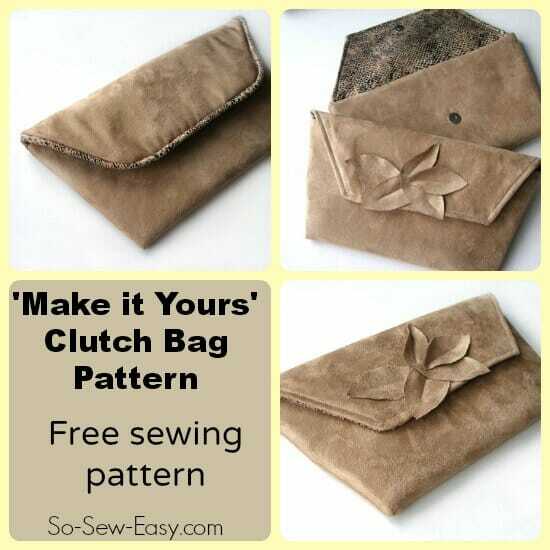 All you need to do is sew the bag using the pattern supplied, but give it your own touches. Change the size, add pockets, embellishments, a strap, hardware, handles, embroidery, decorations – anything which sets your bag apart from the rest and makes it your own design. Then submit a photo of your completed bag along with a few personal details to So Sew Easy before 30th May 2014 (link to the form later in this document). All bags submitted by 30th May will be showcased on the site and on social media and readers will be asked to vote for their favorites. The bags with the most votes win some cool prizes. There are two entry categories. Bloggers. If you have a current blog about sewing or crafting, then you can enter the blogging category. Readers. Open to anyone who sews (worldwide) but doesn’t have a blog. Here’s the fun stuff you could win just for sewing this bag! The opportunity for us to work together to design your own bag/purse pattern, which can be named after you or a name of your choice, and offered to readers on both sites. (All within the limitations of my sewing skills!) We will work together on the design and pattern, and you’ll be involved in the testing and sewing up of the samples, giving feedback, taking photos etc and helping to draw up the instructions. Once the bag is completed, you decide if you want to make it a free pattern for the readers of both sites, or a paid pattern with any proceeds going to the charity or good cause of your choice. Should be a fun and interesting process! Membership of the Pattern of the Month Club for 2014. Get 15 free sewing patterns. Value $35. Any Craftsy class of your choice. Value up to $70. There will be a chance to win prizes just for visiting the site and voting on your favourite bags. Tickets for two for a guided Fabric Buying Tour in the New York fabric district, from Seek NY Tours. First, design and sew your bag. Think about what colors, features and decorations might get you votes. Take some nice, bright, clear photos. Your entry will be voted for based on your pictures so make them good ones! If you are applying for the blogger category, post about your completed bag and about the contest with links back to the bag pattern and the contest rules, on your own site. Go to the entry form on So Sew Easy, complete your details and attach the best one or two photos of your bag. In early June, the contest opens for voting. Return to the site to log your vote and feel free to encourage your friends and family to vote for you too. The bag submitted must have been sewn with the free sewing pattern supplied and cannot be materially changed in shape or design so that it is not recognisable. Last date for submission of entries is 30th May 2014. 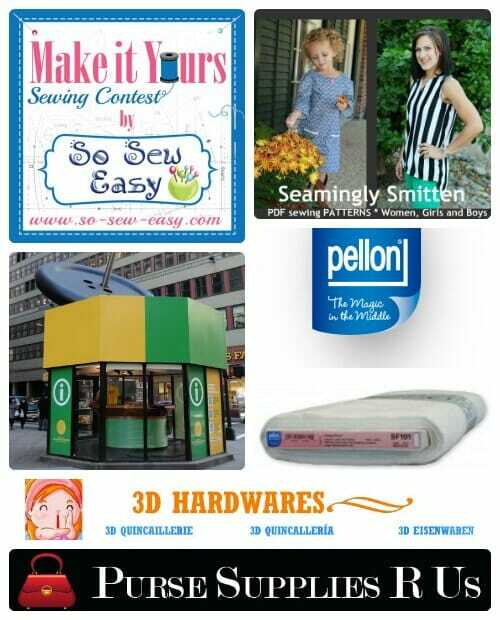 Readers at So Sew Easy will vote on entries and the bag in each category with the most votes will be the winner. Entry to the blogger category requires a blog post showing the sewn bag and linking both to the free pattern page and the contest details page. There is no cash equivalent of the prizes. Certain prizes may only be sent to the USA due to sponsors’ restrictions and these will be marked as such. There is no cash or alternate prize if you do not have a US mailing address – sorry. These companies have kindly donated prizes to this contest. Please drop over for a visit and give them your support in return for their generosity. Already sewn your bag? Fill out the ENTRY FORM. Good luck everyone and happy sewing. I'm really excited to see what you all make. Has the voting finished, do you have the winners yet, I haven’t heard anything since I voted. I did write to all entrants as well, with a thank you for entering email, but I’ve had a lot of trouble with my emails being directed to spam or blocked, so I’m sorry if you didn’t get it Janet. It’s a bit frustrating sometimes, people sign up one week for my newsletter, and then the first time they get it, they report it as spam, and so this makes my future emails less likely to be received by people who genuinely want them. I wish people wouldn’t do that, but I don’t think they understand the impact this has, making my emails rejected as spam by your internet provider. So, I apologise if you didn’t get it. Thank you for the link, I have resubscribed in the hope that I will start receiving from you again. The competition inspired me to make a different hand bag and matching purse. I have also been buying up oddments of materials from charity shops and car boot sales to make some more to raise some desperate funds for our youth club. Thank you again. That’s a lovely idea Janet. I hope it goes well. Hi I just uploaded my entry – had a bit of trouble with the photos and had to do it again so hope it’s not too late. I got it – thanks for the entry and for linking back to the site. I’ll be writing the voting posts tomorrow and you’ll get an email from me with the links you need to give out to collect your votes. Well I finally got a chance to make this clutch and it was easier than I thought! I finished it in an hour or less from start to finish! I just submitted my first attempt to the contest but don’t be surprised if I enter another one. Now that I have the pattern down, I have tons of ideas for more! I think I will make one to match a dress I made for my best friend. She will love it! Thanks for sharing the pattern! I got the entry Dawn, thank you. It IS an easy pattern and you won’t be the only person to have entered more than one bag. When you see how it goes together then inspiration and ideas start to work and I’d love to see what else you make. love the pattern, submitted my first entry. when you see you will know why I plan another lol. what a surprise I had! Haha, yes, I can’t tell you how many times something like that has happened to me! But it’s still really cute and now you know how to sew it, you’ll be bursting with ideas and whip up the next one in super-quick time! Thanks for entering, and yes, it still qualifies. I just stumble upon this today on Pinterest. I just wanted to try make a clutch for some time. This is a perfect opportunity. Just one more question. Can we make more then one entry? Yes Georgia, you can enter as many times as you like. Thanks Deby. That sounds really good. I just did a quick one last night to match one of my new skirts and to get a feel of the pattern and it turned out really great. Better then I expected. I’m wearing it today and a few people even turned their heads after it on the street this morning. I will submit my entry as soon as I can get a photo session going and I plan to do another one with a little more work in it. Thanks Georgia, I got the contest entry, and yes, it would make me turn in the street too. It is absolutely adorable. Thank you so much for sewing and sharing and good luck when it comes to the voting. What a great resource! Thanks for including mine. I had no idea there were so many sewing events going on. Yes Deby, all clear now :). I love the idea and I am ready to participate! I would like to know though, as a blogger, how much I need to publish on my blog about the pattern and process. Would you need the pictures of it? or just the finish project and the links to your blog? And when do I publish it? Hi Daniela, thanks for taking part. All you need to do is feature the photos of your own finished bag on your site. Say that you have sewn it for the Make it Yours contest at So Sew Easy, and include a link back to the posts for the free pattern download, and the post about the contest. If you would like to include the contest logo or any of the photos from my site in your article, that would be fine, feel free to copy them. What you write about your process is up to you and whatever you think your readers might be interested in reading about. You could do a review of the pattern, because of course they can simply download and sew the bag for fun, entering the contest is optional. In terms of when to publish your post, as soon as your bag is ready to submit so you can include the link to the post on the entry form. I hope this helps. I’d love to see what you make Jen, and with some prizes up for grabs, all the more reason to get sewing and share what you make of it. Thanks for dropping over. Oh, I definitely need to get my “thinking cap” on. I found you on madefrompinterest.net and I’m so glad I did. You have some great style and lots of imagination so I know you’ll sew a great bag! Looking forward to seeing it Emily. This sounds like a really fun contest! I may have to give it a try! Good luck Dawn. I’m hoping there will be lots of entries and look forward to seeing how you Make it Yours!